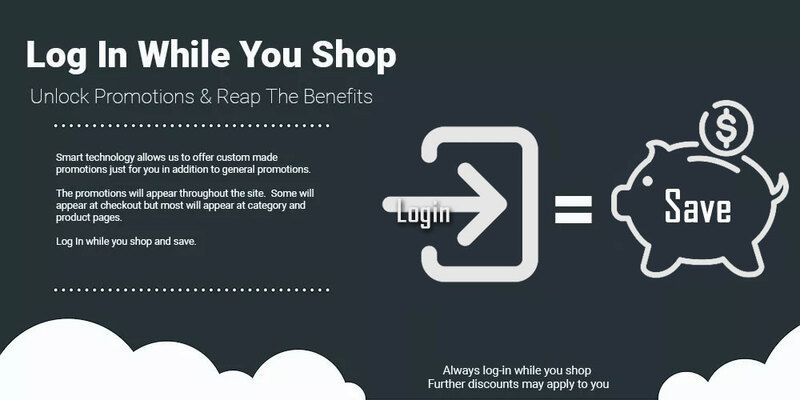 Registering an account and signing-in while you explore has it's benefits.We have designed your shopping and learning experience so you may take full advantage of any special promotions. Some of these promotions are designed just for you. These special offers may include product discounts or reduced or free shipping on certain items or category of products. We have even implemented some regional discounts, like flat rate shipping on full cases of bottles and containers. We are working hard to come up with ways to to save you money! Below are some examples of promotions that may be activated at any given time. An example of this is our current promotion on full cases of bottle and containers. We are in the West Coast so East Coast folks get flat rate shipping of $10 per case. We will automatically show your best deal. We know our product are great, but we like to reward loyalty. Sign-in and you might just trigger a discount created just for you. For instance, we see you are buying some incredible lotion from us, you might need some pumps for those gallons. It would be nice to save a little on them. This can be anything and is very flexible. It's always nice to get free things. So we noticed you ordered a bunch of men's fragrances, but you have never ordered some awesome beard oil. This might just trigger some free samples. Our In-house genius programmers are always hard at work and we will continue to find ways to thank you for your business. Don't forget about our Giveaways.Check them out here. Please keep in mind that these dynamic promotions/discounts are random and can start and terminate at any time without notice. Some of these promotion/discounts might be available to you and not others and available to others and not to you. Promotions/discounts are programmed randomly and are served based on changing algorithms as shown in the examples above. Essentials by Catalina cannot be held responsible for expired promotions that were available at any given time. If you see it and you like it grab it. Happy Savings!